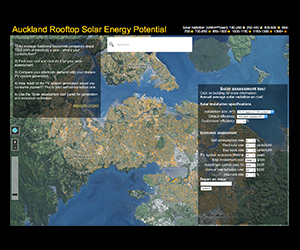 Aucklanders can now instantly assess the viability of installing rooftop solar using a clever tool produced by the Energy Centre, Auckland Council and the Centre for eResearch. The collaborative project was developed using LiDAR data provided by Auckland Council, and a digital 3D model of the city with its topography, trees and buildings. This model was used to calculate the slope and aspect of Auckland rooftops at a spatial resolution of one square metre. This information along with the digital 3D model were used to calculate annual solar radiation on all the roof areas. With the assistance of the Centre for eResearch, a web-tool was developed to make these results publicly available, along with an educational tool to estimate annual solar power output and economic feasibility. The user can select a building by clicking on it and the annual solar radiation on the best spots on the roof will be given for 4 different areas. The user can then select a PV system size, by area. For ease of use, the corresponding approximate kW-capacity of a standard silicon crystalline PV system is already provided. After selecting a system size, the user can select the panel efficiency, either from the given default values that correspond to common PV technologies, of by inserting an efficiency value of choice. The tool will then calculate an average annual solar power output of the assumed system, taking in to account system losses of approximately 12%. Finally, the tool gives an estimate of annual cash flow and net present value of the investment assuming a 25 year economic lifetime – with parametres that the user can change to better fit their individual circumstances, or just to test the impact of each parametre on the economic evaluation of the system.